Jeff Cloutier is a nine year veteran EMT and Field Training Officer at Taney County Ambulance District (TCAD) Paramedics. Since obtaining his EMT license, Jeff has worked in the streets providing high quality healthcare to his community. Jeff is active within the training department, teaching new hire personnel as well as EMT students how to function as a basic level provider in EMS. In addition to his full time job with TCAD Paramedics, Jeff volunteers his time as a Captain with the Protem Fire Protection District. In 2016, Jeff was voted EMT of the Year by his peers for his dedication and outstanding work ethic. Jeff is a dependable, well-rounded EMT who displays the courage and fortitude necessary to succeed in EMS. Jeff’s level of dedication to our profession and to those he serves is top notch. Patients say, “Jeff is so kind and professional. 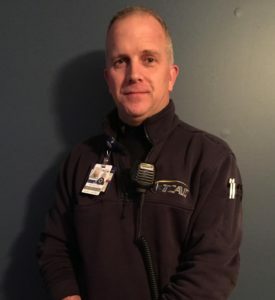 Jeff is there when you need him most and we know he will always put us first.” TCAD Paramedics is proud to nominate Jeff Cloutier for this year’s Star of Life Award.